Have you found your way? The Way that feels right. That feels good. The way where you get to walk towards peace, knowledge, passion, success? Or are you walking and looking for a sign, maybe an arrow that tells you to keep walking, you’re going the right way. Now think of that future student who is deciding right now to choose the way of higher education. Are you ready to really help them? The Fall semester is fast approaching and many college advisors, professors, and student affairs professionals are asking our young people, adults in need of direction, anyone who wants to register at our local colleges and universities to find their way with us. That we will show them the way. That we will provide direction, guidance and support towards their current dream. I’m realizing more and more that providing the way is a huge responsibility. Students are putting their trust in us that we will do our part. That our class schedules will line up. That we will teach what we know and they will understand. That the right text books will be available. That there will housing for them. Because trusting takes courage. Doing anything on your own takes courage. I recently returned from an amazing trip to the North Coast of Spain. I was in Spain for my close friend Marta’s wedding. It was my first time traveling alone to Europe. I had been to Germany many times with my husband who was from there. Yet, venturing alone was a new adventure for me. 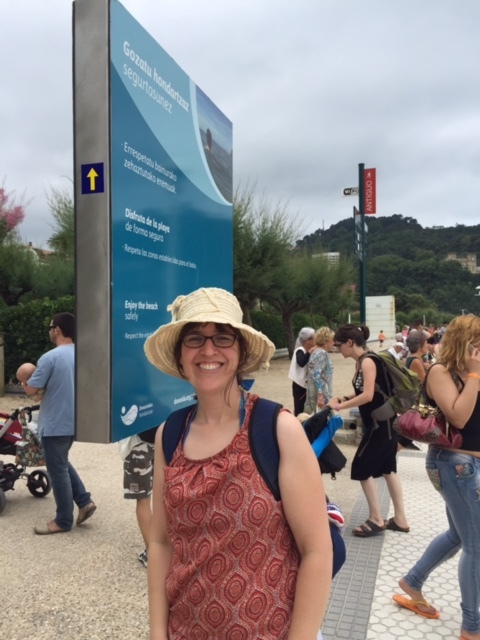 While in Spain, I spent time in the fishing town of Getaria and the beach city of San Sebastian. Both amazing places, with beautiful food, warm temperatures and views straight out of a post card. While there, I had magically found I was also in towns that went through the Northern Way or Camino del Norte. 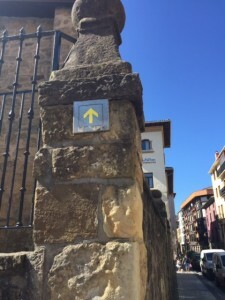 The Camino path from San Sebastián to Gijón, Ribadeo and on to Santiago de Compostela. When I planned my trip to Spain, I knew I would be at least an hour car ride from the French Way, the most popular way, which is located in the middle of Spain that takes pilgrims through the mountains of Spain. With that in mind, the idea of walking the Camino didn’t seem possible. Instead, I planned to enjoy a week of traveling and celebrating both on my own and with my friend and her family. It would be the first time I would be away for a whole 8 days from my two year old twins, 5 year old son and husband since they all came into my life. In motherhood and in marriage, it would seem like a once in a life time trip. For this student affairs pro, mom and wife, it was. Which leads me back to why finding the Camino and finding your way means so much to me. When you are the one leaving the arrow for the next person, you are believing that your way is worth the walk. For years, I advised community college student leaders to plan campus events, represent students and to finish their degrees. I advised to seriously consider transferring and when it got tough, to trust their investment in higher education would pay off. Today, I support students and other professionals through my writing and looking towards my own college degrees to provide my next direction. What I’m realizing now is was what I really needed was a yellow arrow. 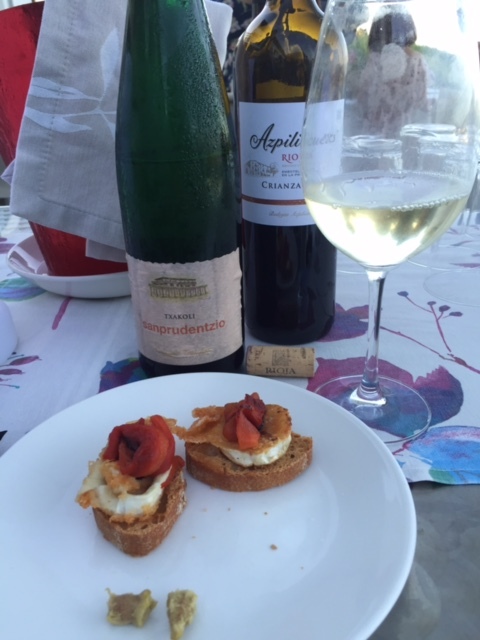 It was after the wedding that I discovered the Camino Northern Way. The wedding festives were happening at the San Prudentizic Hotel, over looking the Basque Country. An area know for Geteriako Txakolina wine, and pinchos (fish and meat on bread). Between the views and this amazing food, life was good and we were all taken care very well. I was part of the crew that was staying at the Hotel Itxas Gain, in downtown Getaria. The crew included myself and this amazing group of PhD students from University of San Fransisco, who happen to be friends of the groom. What I didn’t realize was, there was more than one route to Santiago de Compostela. I followed the crowd out the door and before I knew it I was walking back to my hotel on the Camino. That night, I thought about the Camino. How here I was, finally near a path I had longed to walk. Do you ever wonder how many college students out there have felt the same way. That they probably had days where they would drive by your college wondering maybe this is the year I sign up. Or maybe this is the year I come back and finish. That night I decided, I would walk the Camino. 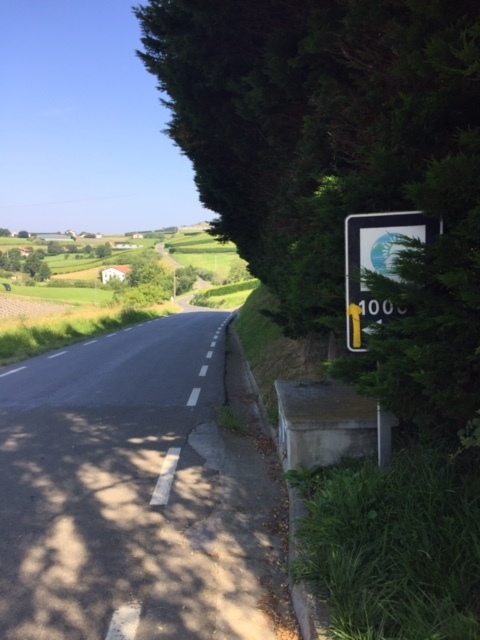 The next morning, I went down to the front desk and shared my desire to walk the Camino. Not sure how long or how far, but that I wanted to walk some part of it. The owner of the hotel printed me a map of the Camino, which way to go, and how to get to the next town. He was a little concerned with me being a newbie. (An hour later I would understand why. The part of the Camino I was to walk would take me up a few steep mountains.) I smiled and said thanked the owner for his advice. I headed back up stairs and packed my bag. My good friend Marta drove me back up to the hotel where the wedding was and where the Camino continued. We hugged, she wished me luck and I was off. 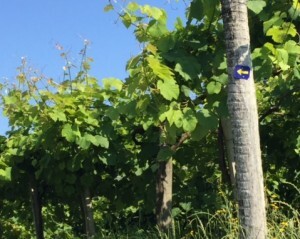 The first thing you notice about The Camino is yellow arrows. Someone before you has laid the way. To me it was the best test of faith. For centuries, people, known as Pilgrims have walked these paths; following the directions left by someone before them. At the end of the path is the church Santiago de Compostela. I knew I wanted to walk the direction that the pilgrims were walking. You might be asking, what makes the Camino so different than a hiking trail in the mountains? You get a map and you walk. The Camino offers purpose. Direction. For our students, we ask them to follow our arrows. To gain purpose. Direction. Maybe it is direction towards a passion. Maybe it is direction out of town. 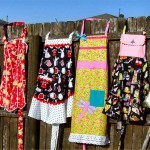 Maybe it is the direction towards a purpose they knew in their heart they would be good at. Either way, we leave arrows for them shaped as educational plans to find their way. I love that someone ahead left an arrow to help me find my way. The Camino, the Way was my way that day. As I walked, I thought to myself, whatever I’m meant to do, to have, to live, to love is the Way. The Way that is meant for me. The yellow arrows taught me to never doubt, the way is always there. You will find the next arrow you need. When you need it. The Northern Route travels through 7 large cities and many small towns. To walk the whole thing, from San Sebastian to Santiago, your talking at least 36 days, over 806km. You can carry your supplies and backpack with you or you can invite in a tour guide company that meets you along the way. There are many ways you can sleep on the Camino. Hotels, hostiles, camp. For the hour I walked the Camino, I was able to travel from the town of Getaria to the city of Zumaia. 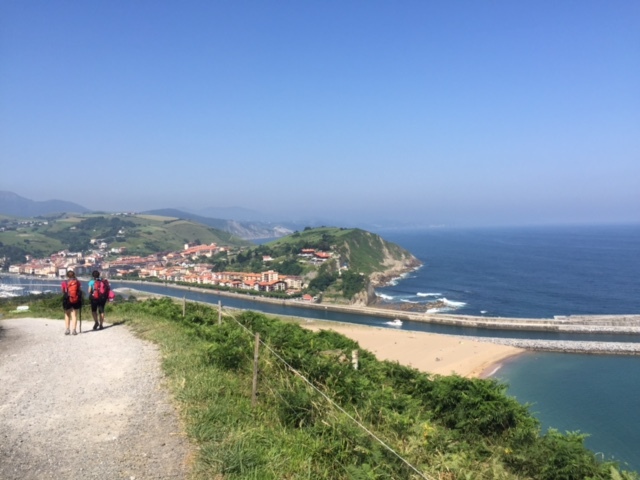 When I got to Zumaia, I felt like I could just keep walking. And walking. I felt this amazing energy along the Camino. At one point I met two Pilgrims from Holland. They had been walking for three months. Whenever you meet someone walking, you always want to ask why? Why are you walking? What are you learning? How has it changed your life? These Pilgrims have taken a break from their lives back home to walk. To connect with nature, themselves, each other. In away, I was doing the same. I was walking because I always wanted to. But always wanting to do something can only take you so far. What was it that I was really searching for? I wasn’t walking the Camino with my husband like we always planned. So I felt some hesitant to even walk. Will he be hurt I went ahead without him? Yet, years ago, someone told me that the Camino will call you when you least expect it. For a special reason, it was my time. I was to walk, what I could, by myself. We often ask students, why are you going to college? Why are you studying this particular subject? We ask, because we know purpose fuels direction. That if you know why you are doing something, you are more likely to follow through, even finish it. Maybe even it enjoy it. We also know that getting a college degree or certificate is truly a journey you walk by yourself. There are moments there are others around you to support you, guide you. And then there are times you are left alone to succeed. I can see now why a student might not finish. I can see how a student might feel overwhelmed with even the idea of 12 units, 4o units, 60 units, 120 units. The pilgrims that passed me, amazed me. The Camino is a long journey that takes time, energy, money, and the will to finish. Earning a college degree is a long journey that takes time, energy, money and the will to finish. Of course, walking the Camino will end faster than a college degree, but they both provide that direction, the need for purpose. When I was getting off the plane from Madrid, I discovered I was sitting next to a woman and her daughter who had just walked the whole Camino across Spain. It was the mom’s second time. I asked her, what did you learn. She told me everything works out in the end. 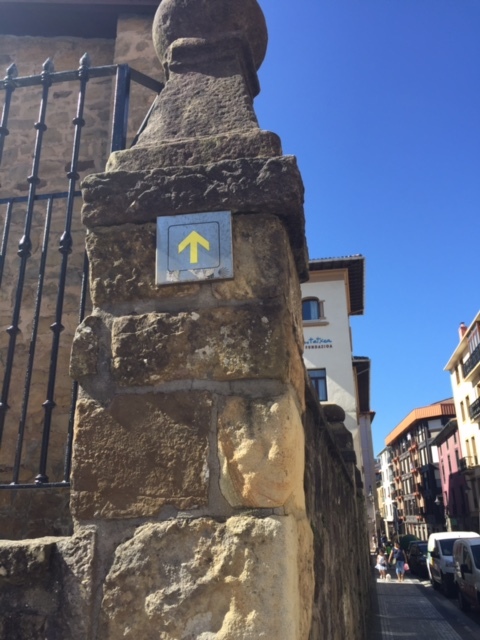 The Camino provides you with direction, purpose, yellow arrows. It reminds you to yes, follow the yellow arrows but don’t worry if you don’t see one. Instead, “let it be”. Unless you really need to say something, find something to do, let it be. Life is meant to be enjoyed, to explore, to love, to be inspired, to share. If for some reason you feel lost, look for the “yellow arrow”. It will be there. And if you don’t see it right away, keep walking. You will see it. Sometimes where you least expect it. For our students, they are walking the Camino of Higher Education. 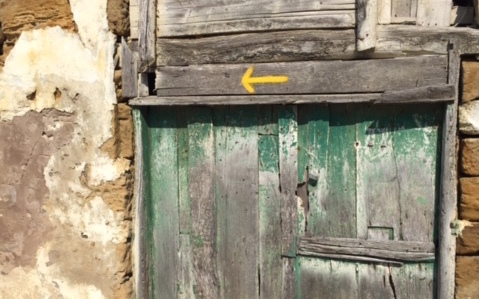 The next time you are with a group of students, and they seem a bit lost, think about the yellow arrows on the Camino and ask yourself, what can I do to provide a sense of direction. What kind of yellow arrow can I leave for them. 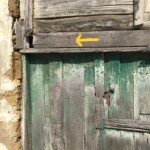 For you, I’m leaving you with the yellow arrow I found walking to the Combs in San Sebastian. At the moment I took this picture, I felt a sense of peace. My direction, our purpose is meaningful. Keep following your yellow arrow. ← Checking In. It is Summer! Outside! Outside!